It is not surprising then, when one examines Michele Kort’s resume more closely that you notice that she has also authored three books concerning the lives of individuals associated with the entertainment industry, Dinah Shore, Chas (formerly Chastity) Bono and Laura Nyro. Shore of course, enjoyed a lengthy and successful career as a singer, an actress and as a television personality, who hosted two variety shows and two talk shows. Chas Bono is a writer, singer and actor and the trans-gendered child of Sonny Bono and Cher. 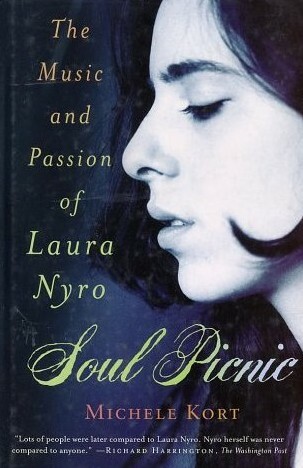 It is however, the biography which Kort penned concerning the life of singer/songwriter Laura Nyro that led Riveting Riffs Magazine to the author and editor, and she was gracious enough to take time to discuss her motivation for writing the book The Music and Passion of Laura Nyro Soul Picnic, published in 2002, the depth of her research and she providee insights into the lives of one of the most prolific songwriters in the past fifty years. For those music fans who are not acquainted with the music of Laura Nyro, perhaps a brief overview of her career, will help you to appreciate her accomplishments. For those who are younger than thirty years old, you may need to make good use of google, because tragically Laura Nyro passed away at the age of forty-nine, in 1997, from ovarian cancer and many of the hit songs that she penned were recorded in the 1960’s and 1970’s. Some of the songs that Laura Nyro wrote and which were covered by a plethora of artists, only some of whom we will mention, include; “And When I Die,” (Blood, Sweat & Tears, Peter, Paul and Mary, Chet Baker), “Wedding Bell Blues,” (The Fifth Dimension, Lesley Gore, Bobbie Gentry), “Stoney End,” (Barbra Streisand, Linda Ronstadt), “Sweet Blindness,” (The Fifth Dimension), “Time and Love,” (Diana Ross, Labelle, Kenny Rankin), “Stoned Soul Picnic,” (The Fifth Dimension, Staple Singers, the Four Tops), “Save The Country,” (George Duke, The Fifth Dimension), “Hands Off The Man (Flim Flam Man),” (Barbra Streisand), “Eli’s Comin’,” (Three Dog Night, Maynard Ferguson), “Billy’s Blues,” (Mary Foster Conklin). 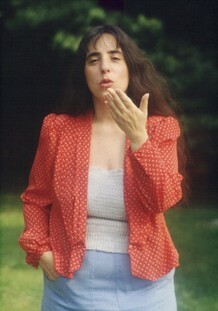 Despite the fact that she wrote many hit songs and she performed in sold out venues, Laura Nyro remains excluded from the Rock and Roll Hall of Fame, although her name appears on the list of nominees for 2010 induction, and she still has not been admitted to the Songwriters Hall of Fame. Michele Kort’s journey with Laura Nyro’s music began as a teenager in 1966, when her clock radio blasted out a syncopated piano beat and the words to “Wedding Bell Blues,” and so began a lifelong fascination with the music and the life of Laura Nyro that has persisted to this day. “I was a crazy fan of hers. When she was at the Troubadour (in Hollywood) one time, I made a tuna fish sandwich for her and I brought it to her backstage (Nyro’s music publishing company was named Tuna Fish Music). That was nothing compared to what my nuttier cousin Helene did. There was a story that came out about how Laura wanted ducks or something and Helene went out and she found a place where she could buy a baby duckling and she gave Laura a baby duckling (she laughs). She said thank you for the tuna sandwich, but later I thought, why would someone eat something that a fan randomly gave you? I think she had to give away the duckling, but we stayed for two shows that night and during the next show she said (she mimics Laura’s whispering onstage voice) ‘I got the most wonderful present. Someone gave me a little baby duckling (she emphasizes each phrase and pauses like Nyro would have). Whenever anyone repeats Laura’s stories, they always talk in her voice,” says Kort with an air of respect. The book which Kort originally thought, would take her one year to research and write eventually became three years, before The Music and Passion of Laura Nyro Soul Picnic appeared in print. “At the very beginning of the project, I knew a woman who knew her (Laura’s) partner Maria Desiderio, and I got a copy of my proposal to her, through this woman . This friend of Maria’s called me and told me that I was the only person they were considering. Then they called me and ultimately they decided not to, because there was an article written in the New York Times by a woman, Deborah Sontag and they didn’t like this article, so that was it and they didn’t want to talk to anybody. The way the woman expressed it to me was, ‘There are seven of us who have taken this vow of silence,’ and it was kind of dramatic. I just found it ridiculous that nobody ever cared about these other seven people. I thought I am not going to try and contact these people now, I am going to do the rest of my research and over time, people are going to hear who I am, understand who I am, and where I am coming from, and that I am coming out of love. I am not trying to write an exploitative book, but I am trying to write a very respectful book. If she was alive, I would be destroying her privacy, but now that she was gone, I couldn’t and she belonged to history now. As long as I was respectful of her dad and of her son Gil, I felt okay about it. After a number of months I sent a letter to her father and her father responded to me. He ended up being terrific and her father became very interested in preserving her memory. When they did a play called Eli’s Comin’ in New York her father was there almost every single night. He was at the door (you can hear the smile in Kort’s voice) talking to people. He was revitalized I think, by the attention his daughter got. Maria Desiderio died (the year after Laura) so I never got to talk to Maria, but all the other people who supposedly weren’t going to talk to me, talked to me. I became good friends with her cousin Danny and her friend Patty DiLauria was wonderful to me. They loaned me pictures. By the end I had a tremendous amount of support. On my book tour when I went to New York, a number of her family members were there. It was wonderful. It was a strange coming together of people in general, because I thought, I never knew this person (Laura Nyro) myself. I had only met her as a fan backstage, but by the end of the project, I knew more about her than anyone did, because I knew everybody’s stories about her. I knew all of the stories,” says Kort. Michele Kort who counts “Captain St. Lucifer,” among her favorite Laura Nyro songs and considers New York Tendaberry as her most prolific album, something which the music critics of the day agreed with, has not allowed the legacy of Laura Nyro to remain only with the book she authored, but she maintains a blog to help preserve Nyro’s memory and to continue to keep her music in the forefront. “For one thing, I think that when you spend that much time, and you build up this much expertise about someone, you want to keep going with it (she laughs). It is still on your mind. The other thing is that Laura still has not got the recognition that she deserves. It would be amazing if she got elected to the Rock and Roll Hall of Fame this year. It is totally amazing that she is nominated, because she is forgotten by most,” says Kort.